looks nice and sounds lovely. and very neat idea with the falling letters. better than a scroller :) so strong thumbs up! nice little invite, nice and cute music, and i like the text writer too! There actually was a reason why I declined your request to add it! @stingray oh, damn. Stupid me. I even forgot to thumb it up. Feel free to thumb it down, makes me smile even more! Quality capture, thank you Fra, much appreciated! Replaced old YT link with yours. 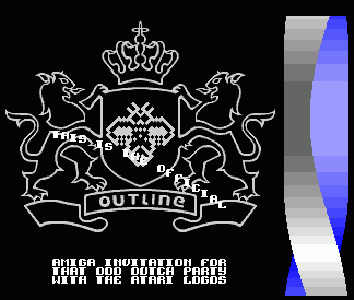 Amiga invite for Outline, nicey. thumb up for the platform. Cool text writer and chippy is sweet. well, not bad little invit, nice text writer. Very catchy tune and nice writer, but the twister is way too simple and boring IMHO. The twister is almost too basic! ;) But i love twisters and you have some smooth sinetables there! rulez added on the 2015-05-07 02:42:26 by ɧ4ɾɗվ. Get all those Amiga lamers to the ultimate Atari party! Niiiiice with a good chippy, but... there is lack of sth..
Really cool oldskool style. This invitation keeps the spirit of the first demo years on the amiga alive. Well done. page created in 0.017868 seconds with 16 queries.